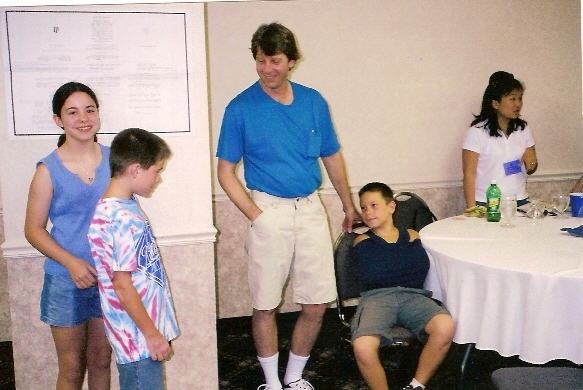 June 30th, 2004 Photos below! The convention was a success! Everyone expressed how much they enjoyed being there and we did have a great time. One young man, Roy Shirley, drove over 5 hours in pouring down rain to get there from Pennsylvania. He brought his three children so they might learn more about the Shirley family. It was great to meet him and the kids although we do not know who he is descended from. We hope to make further inquires as to his background. This was a surprise group who we had never had contact with before. Thank you Roy for making the trip to Virginia. Please email me when you have a chance. We also met another couple from Pennsylvania, Tim and Georgi Shirley. It was so nice to see the younger ones becoming interested in their roots. Thank you for coming Tim and Georgi. Please let me know how we can help you learn more about your Shirley heritage. Email me too! We had the opportunity to meet yet another family from Pennsylvania. Jim, Jennie and Dorothea. Thank you for coming. We'll work on the Armstrong and Westmoreland connection. We enjoyed meeting several others, whom we had not met before... Penny, who brought her laptop computer, Bernard and Nancy. Bernard was our guide some of the time. He read the map and helped plot out the direction to go. It was great to see Ellen again. She works for Williamsburg. Great to see Paul and Pat from New York! They attended a Shirley meeting several years back when my daughter and I was in NY and on our way to Canada to learn more about Anne Shirley of Green Gables and see where the movies were made, etc. Thank you for coming. One of the highlights was 3 SHIRLEY cousins meeting for the first time. Gary from Washington, George from Mississippi and Kenn from Virginia. They each participated in the DNA testing and as a result learned they were cousins. The lineage connects to the Darlington Co. SC Shirleys. They had a fun time spending time together and getting to know one another. Now they are committed to learning even more. They have already ordered extended DNA testing since their return from Virginia. DNA is helping where the paper trail ends. Here was a prime example of how DNA can help. Another highlight was when Bennett Greenspan spoke to us and gave a presentation on DNA. We enjoyed meeting both he and his wife, Robin. Thank you for being there. It was so good to see Margery who went with us on our last trip to England. I believe the year was 2000. Thank you Margery for coming. Also good to see Dale from Washington state. He has attended several other gatherings thru the years. I first met him in 1980. 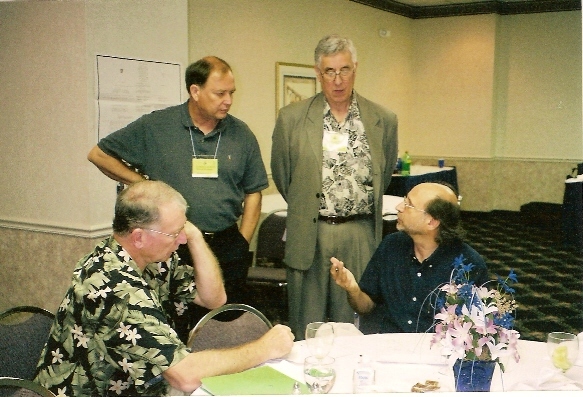 That was the year we had a meeting here in California. Thank you for coming. How great to see the cousins Margo, June and Bertie from the Thomas and Mollie Grubb group again. They were at the Convention in Kentucky several years ago. We had a great time together. They came from Illinois and Florida. Thank you for coming. If I left anyone out, please forgive me. I THINK I mentioned everyone. I do want to thank Barbara for going with me. She has traveled with me to most of our meetings. She is the driver, the secretary and my helper. I really appreciated her help and I know all of you enjoyed meeting and talking to her. 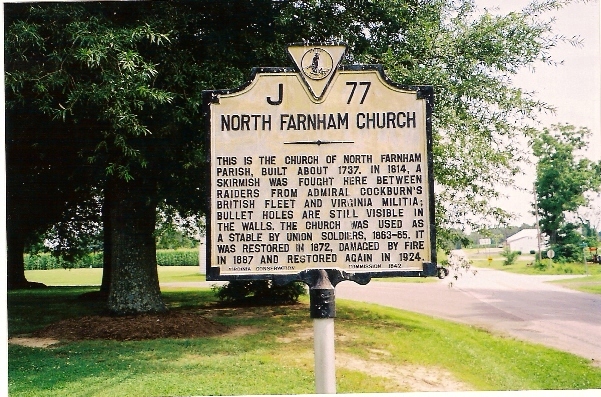 On Friday, June 25th, Barbara and I drove to Northumberland Co. VA area from Richmond which was about 1 1/2 hour drive. We met with Bobbie at the Rice Hotel and Houghlett Tavern in regards to lunch on Sunday. We also met Mr. Haynie who is involved with the Northumberland Co. Historical Society. 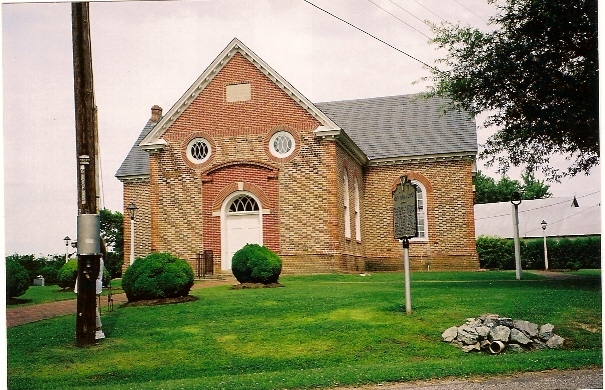 We then drove to Wicomico Parish to check that out. Decided it was to far to include on Sunday. We drove then to Farnham Parish and decided that was a go. We had just enough time to get back to Richmond for our Friday evening informal gathering. Made it with just 5 minutes to spare. Saturday I spoke on the early Shirley families of VA, MD and New England states. The time period was from their arrival until about 1730's. The purpose was to expose everyone to where the Shirley's could be found that early in history and the names of some of those associated with them. Just before lunch I let everyone vote for who they thought Thomas Shirley of Northumberland Co. was connected. The choice was to vote for James Shirley the goldsmith or the Wiston family of Shirleys. It was a tie between the two families. Then again.... this Thomas might not connect to either family. The exercise was to show how difficult it is for us to make a determination as to who Thomas Shirley of Northumberland Co. VA was descended from. After lunch we drove to the Shirley Plantation. 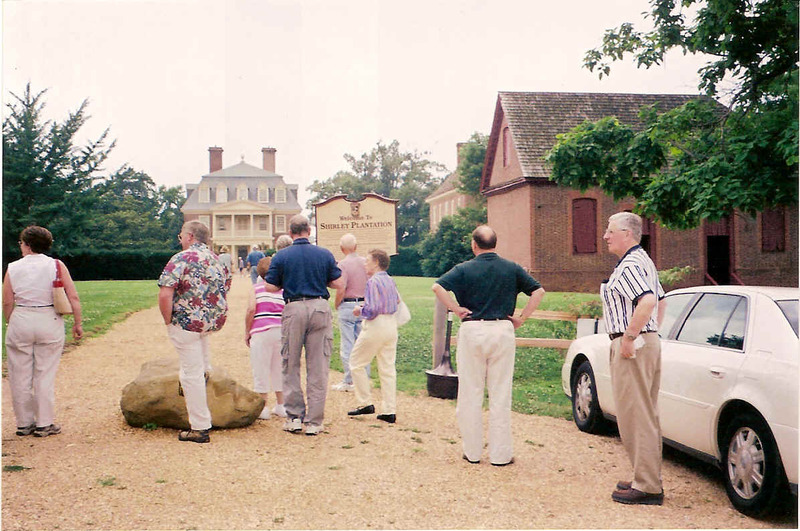 Everyone took the tour of the house and had the rest of the afternoon to walk around the grounds. The guide was very good. The weather was great too. Sun was shinning even though earlier it had been raining. After dinner at the hotel we heard from Bennett Greenspan and he gave a visual presentation. He gave everyone time to ask questions and afterward, he mixed and mingled with people and continued to answer questions one on one. Sunday, we took the group to Northumberland Co. and took a drive to the area where the original St. Stephens Parish church stood. This is where his children born in 1670's were christened. We also saw the area where Thomas Shirley lived. What a beautiful valley. He lived in a very nice area. We continued on to Coan River and to the Potomac River. Both are not very far from where his land was. The Coan River connects to the Potomac River. We could look across and see St. Mary Co. MD. I think everyone had a better perspective of the distance. After lunch in Heathsville, we walked over to the Northumberland Historical Society and looked thru books etc. Had I known they had so many books, we would have allowed a couple of hours or more for this. From here we went to Richmond Co. to Farnham Parish. The lady there let us in as arranged on Friday, and she contacted a minister who came and talked to us about the history of the early church, etc. He was very good. He knew his early history and we enjoyed listening to him talk. Afterwards it was back to Richmond and many departed even before going back to Richmond. All of the PA groups left from Northumberland Co. to head for home. The rest of us drove to the hotel and some of us went out to dinner before we called it a day. The next morning the cousins from FL and IL and Barbara and I went to the airport for our flights home. I have had several emails already expressing what a great time everyone had in VA. I am delighted you all enjoyed the trip. I did too. I was a bit sad as this WAS the last convention. I said that 9 years ago. I decided to have one more and this was for sure the last one. I know some of you are trying to convince me to have yet another, but it is just too much work and I am not getting any younger.